If you want to dip your toe and see how it feels -come to a taster throwing session. 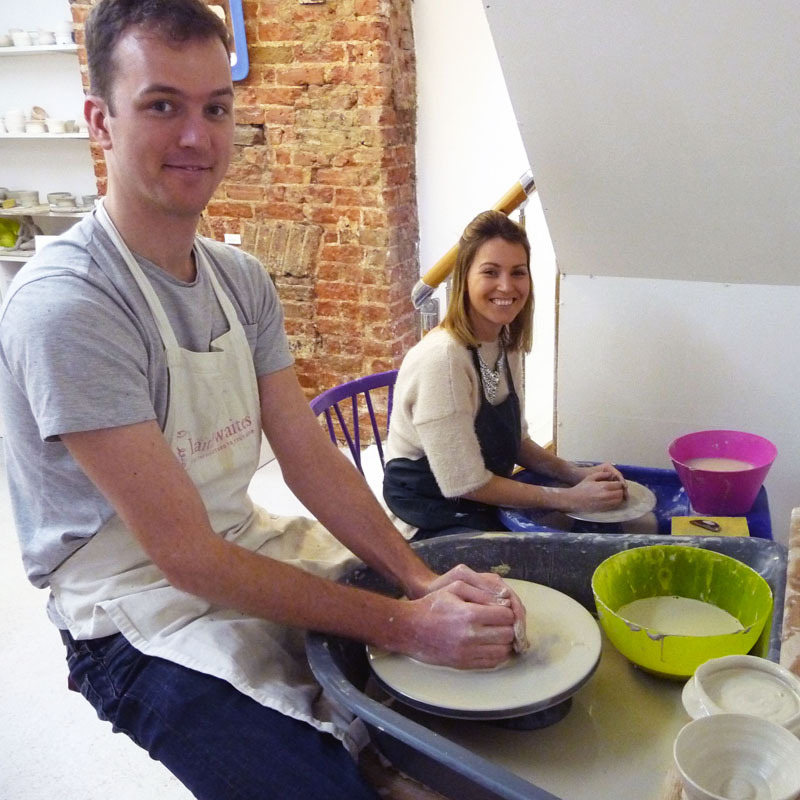 Now we’ve all experienced the Great Pottery Throw Down – we all want a go! We use electric wheels – if you drive a car then you are used to the accelerator – it’s that simple! Whether you are alone, celebrating an anniversary or team building with colleagues – we all want to capture that Demi Moore & Patrick Swayze “Ghost” moment! This price includes all materials & returning 2 weeks later to paint your thrown pot. You can return to paint your pots any day except Saturday. You must return to paint within 4 weeks of your throwing session. You are welcome to come alone or with friends, however we need a minimum of 2 people to run a session, so if you're coming alone, you may need to be flexible with your dates so we can match make you with another group. Sessions last between 45 minutes to 2hrs depending on the number of people booked in. We have 5 potters wheels, and will take a maximum of 10 people per session. * Please note, full payment is taken at the time of booking. Changes or refunds are only accepted with 48hrs notice. You must arrive promptly for your session, we will wait a maximum of 5 minutes before starting the session. Mondays, Wednesdays & Fridays at 2:30pm. Saturdays at 10:30am & Sundays at 11:00am. staff to find the best time for you. Step 1 - Our studio assistants will explain the main points of working on the wheel and will demonstrate how to throw a pot. Then it’s your turn. They will continue to support you as you work the wheel. Step 2 – You will have 2 balls of clay to work with. If you are in a group you can take it in turns and learn from each other. We aim to have at least one good pot to be proud of by the end of your session! Step 3 - Choose which pot you would like to keep. Make sure you have written your name and the date on your ticket. We will scratch these details, on the base, when the pot has dried off. Your pots will take up to 2 weeks to fire, ready for decoration. Step 4 - Return to paint your pot 2 weeks later and then we will glaze and fire them again ready for collection a couple of days later. If you can’t get back to paint them we can glaze and post them to you. The session lasts from 1 – 2 hours depending on the number of people. You can then return after 2 weeks to decorate them or have them clear glazed. The session lasts from 2-3 hours depending on the number of people. Each person takes it in turns to have a ball of clay and have a go on the wheel. The others then choose a mug or a bowl to decorate. The thrown pots are clear glazed and fired and ready to collect 2 weeks later. Please be aware that sometimes clay fired items can break or at worse explode in the kiln. We try to control for these events but it is not always possible. It is the charm but also the frustration of working with ceramics. If you have lost your pot in the kiln in this way we will offer you a spare as a replacement. It's best to book As early as possible as these sessions do tend to book up. IF YOU are trying to BOOK FOR TODAY, YOU MAY WISH TO CALL THE SHOP INSTEAD ON 01273 628 952. Children must be 12yrs and over. For under 12's we run special sessions during half terms- get in touch for more info. If you are booking for 6 people or less, please choose the session that suits you best- we'll ask for the specific date below. If you're flexible please tick multiple boxes. If you're flexible, please provide a few options. If you're celebrating a special occasional or have any questions, pop the details below. Please be aware payment is required ahead of your session, ideally at least 1 week before, this can be made over the phone or in the shop.